Despite the disappointment stemming from India’s Rafale deal, the country’s future in carrier aviation remains bright. In the fallout of the Rafale deal, can the Indian naval air arm be saved? 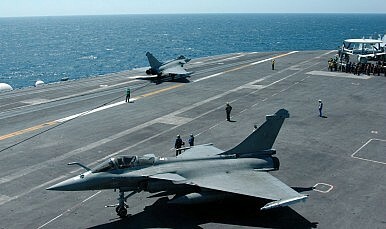 More to the point, could French-built Rafale fighters still, eventually, fly from Indian aircraft carriers? As the Diplomat has detailed, one of the fruits of India’s relationship with the United States should be the EMALS catapult system. Catapult launched (CATOBAR) aircraft differ from their conventional and Short Take Off (STOBAR) cousins in several ways, primarily with respect to their ability to endure the stress involved in the catapult system. Although INS Vikramaditya currently operates MiG-29Ks from her STOBAR deck, no one has yet made clear which fighter will fly from India’s catapult-capable carriers. At the moment, only five fighters operate off CATOBAR carriers; the F/A-18 Hornet (and its Super Hornet cousin), the A-4 Skyhawk (theoretically off the nearly immobile Brazilian carrier Sao Paulo), the Rafale and Super Etendard, which fly off the Charles de Gaulle, and the F-35C Lightning II. Various schemes have been proposed over the years to develop CATOBAR variants of the MiG-29, Su-33, Eurofighter Typhoon, and Saab Gripen, but none of these have yet come to fruition. Of these, the F/A-18 will be very old by the time INS Vishal (presumably the first CATOBAR Indian carrier) will enter service, and the Etendard ceased production in 1983. CATOBAR conversions of the Typhoon or Gripen would be extremely risky, and converting the Soviet fighters would combine that risk with considerable age. This leaves the Rafale, the F-35C, and some as yet unannounced project by some as yet unannounced country. Although the Rafale normally operates in CATOBAR configuration, it is designed to have the capacity to launch as a STOBAR (short take off) aircraft, meaning that it could help resolve one of the central problems with India’s carrier acquisition strategy. To recap, India is purchasing or building three different carriers of wildly different sizes and capabilities, limiting the extent to which it can take advantage of a common pool of expertise and spare parts. The Rafale can’t resolve this problem entirely, because fighters optimized for serving on STOBAR carriers could not easily operate on the CATOBAR carrier, and vice versa. However, the use of a common airframe would surely create some commonalities in maintenance and training. The F-35C, on the other hand, is strongly disliked by the service that is supposed to be purchasing it in great numbers. And for anyone who has viewed India’s effort to purchase the Rafale with some combination of bemusement and frustration, imagine for a moment the process of getting India involved in the F-35 project. The Rafale isn’t perfect; it’s expensive, the frame has limitations, and it will never achieve the stealth capabilities of the F-35C. But the French have demonstrated that it can fly, and the Indians have demonstrated (finally) that they can buy it from the French. While the size of the current sale may disappoint many in France, and the lack of technology transfer may disappoint many in India, the foundation for future cooperation remains strong.